I’ve always liked fizzy drinks, the regular ones you’d get in any supermarket. It doesn’t usually matter which flavour it is, just as long as it’s a can of sweet fizz then I’ll drink it. I’ve been drinking them for years and it wasn’t until about five months ago that I realised all of my fluid intake (aside from the little I gained in my food) was all from fizzy drinks. Not only was I constantly dehydrated, suffering from headaches and having some major problems with my teeth but I had a real weight problem too. No longer did I feel like a fit and healthy twenty something, but I certainly didn’t feel 32. If anything I felt 53 but could I really be surprised at all of this considering I was consuming over two litres of fizzy soft drinks every single day? No, not really but I was still quite shocked at finding myself in the position that I was. After a real telling off from my dentist, I decided to take a stand and actually get myself healthy and being quite an all or nothing sort of guy, I decided to really go for it. I began doing a lot of web surfing to see if bottled water would be a better alternative to tap water because let’s face it, it’s always a little cloudy when you pour it into a glass (I remember from the very few times in my life I did this). I naturally assumed that water labelled spring water, or pure water would be exactly that…pure but I soon discovered that it wasn’t actually the case at all. I was quite astonished to find out that the vast majority of bottled water was simply tap water, some of which had been put through a less than adequate filter in an attempt to get rid of the heavy metals, chemicals and other untoward substances found in our public water supply. It was then that I discovered a website called fluoridealert.org which not only discussed the serious health issues associated with daily consumption of the substance but also pointed toward water distillation as a means of getting rid of it. Once I’d found out about the process of distillation, I was stunned to discover that it was the only method of creating truly pure water. I searched for easy ways of distilling water and that’s when Make Water Pure came up with their at-home water distillers. I ordered myself a water distiller there and then. It arrived promptly the next day, and was immediately displayed proudly on my worktop, like a beacon of my future health and vitality. It really spurred me on just seeing it. That was five months ago and I can honestly say I’ve never looked back. 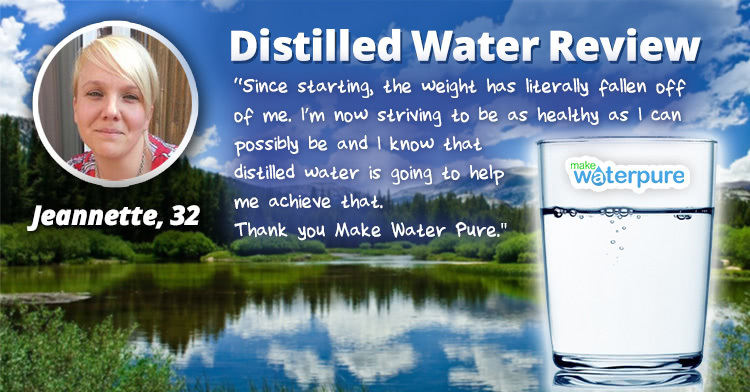 When I started drinking distilled water, it took a lot of getting used to. My body was craving the sugar and aspartame from the fizzy drinks I’d been enjoying day in and day out and now it was getting pure, crystal clear water. It took my body just over two weeks to finally realise that pure H2O was actually what it wanted, and what it needed. My sugar cravings disappeared and distilled water became my go to drink to keep me hydrated. Since starting, the weight has literally fallen off of me. By quitting my fizzy drink habit, I’ve ditched between 800 and 1000 calories a day (no wonder I was gaining weight fast). I’ve not increased how much food I was eating, if anything drinking distilled water has just pushed me to eat healthier too. As a result, I’m no longer tired or suffering from the horrendous headaches that I once had. My fluid intake has increased too from roughly 2 litres per day to around 3 which is just making me feel full and hydrated. As fantastic as all this is, I think the thing I’m happiest about is the fact that the problems I had with my teeth have pretty much disappeared. Since cutting all the sugar out of my diet, my dentist has noticed a huge improvement. He says that I’m no longer putting my teeth through multiple acid attacks every day. I’ve kept on top of my at home dental routine to help them on but I can’t thank distilled water enough. It’s quite literally turned my life around and I couldn’t be happier. I’m now striving to be as healthy as I can possibly be and I know that distilled water is going to help me achieve that. It’s also going to be the reason that I’ll still have my own teeth when I’m old. Thank you Make Water Pure.